Do you know why smartphones with nearly bezel-less all-screen designs are so popular right now? Because they’re awesome, that’s why. Thinner bezels means a more immersive viewing experience, which is something everyone obviously wants. But why should it be confined to your smartphone? 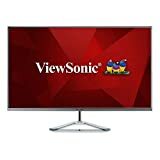 The ViewSonic VX3276-MHD 32 Inch 1080p Frameless Widescreen IPS Monitor is a gorgeous PC display with great contrast and vivid colors. Our favorite thing about it is the design, though, since it has practically no bezels!